My Printer Prints Too Small. What Can I Do? - Ask Leo! My Printer Prints Too Small. What Can I Do? It's not the printer. Software on your computer controls print size, so you need to investigate the settings on your computer or in the application that you use to print. My printer prints so small that no one can read it. How do I change the size of the fonts? Unfortunately, there’s no single solution that applies in all cases; the issue can be caused by many different things. Just as unfortunately, it’s rarely the printer itself at fault, but the software involved somewhere along the way. I’m afraid the result can be exceptionally complex and confusing. A printer only does what Windows and the applications that are printing tell it to do. Those, in turn, only tell the printer what to do based on the characteristics of whatever it is you’re printing. That means if it’s printing too small, either what it’s printing actually is small, or the application doing the printing is telling it to print at that size. I’ll break that down into two areas: the printer driver and application you’re using to print, and the source material you’re printing. Print dialog via Microsoft Edge. Printer drivers, and the options they expose, is the first place to look. Unfortunately, it’s also the most complex and, quite frankly, the most frustrating place to look. In addition to a “system” print dialog, each application that can print – such as your word processor or your internet browser – can provide its own printing interface instead (which can, optionally, also allow you to go back to the system dialog if you prefer). 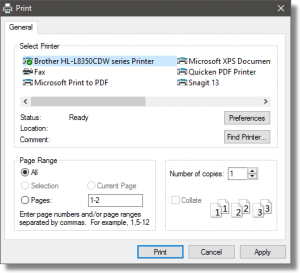 Multiply that by the number of printers which can then provide their own printer-specific information or settings dialogs, and the number of different dialogs and collections of print-related settings quickly becomes overwhelming. Needless to say, I can’t give you “click here, then here” kind of directions for this. You’ll need to do some exploring. Start with the print dialog for the program you’re using. Options here are generally limited to the basics: page range selection, orientation, perhaps margins, and so on. On some, however, there may be what’s called a “scaling” option. This allows you to specify that the page should be printed as-is, at 100%, or alternately “scaled to fit” – zooming in or out to fit the content to the actual size of the printed page. If there’s nothing helpful in the initial dialog, then look for “settings”, “preferences”, “more settings”, or “advanced settings”, which may give you access to more advanced controls for your printer from that application. If present, “zoom” or “scaling” options are often buried in advanced dialogs. As I mentioned, many applications present their own print dialog, but in many cases also allow access to the “system print dialog” – meaning the default Windows print dialog – as an alternative. Look for an option to do so, and then go exploring in the settings presented there. Exploring the various options exposed by the print dialog and the printer driver, while confusing, is often the best first place to start. Many applications also include a “Page setup” option, often under a File menu, separate from the actual Print option. These usually include settings such as margins, print area, and more. The most common mistake I see is that when viewing a web page, people just use the browser’s print function. It’s counter-intuitive, but that is rarely the best way to print the contents of a web page (unless you want all the ads and extraneous material). On many web pages, there is a link that allows you to print a minimally-formatted version of that page that looks better on paper. (It’s possible for web pages to do this for you automatically, but generally they do not.) Especially when it comes to email applications, this approach to printing a message can have dramatically more satisfying results (be sure to open the message in its own window to start – a “preview” window of email rarely prints well at all). Look for a printer icon, for a “formatted for print” link, or something similar. Click on that, and then use the browser’s print function to print the result. Many applications have a great deal of control over what portions of what you’re looking at are printed. 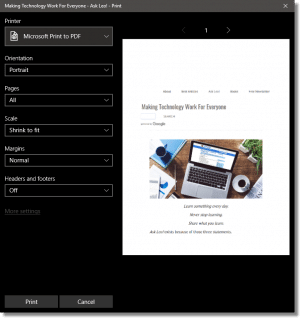 Microsoft Office programs, for example, often include the ability to scale, define the range of pages you want printed, margins, headers, footers, and more, all within the application. If you print often, it can be very helpful to familiarize yourself with these options. Sometimes the options you want simply don’t exist. Be it the application or the printer software, no matter what you do, the web page you’re attempting to print just prints wrong. Evernote (as well as a few other applications, such as Pocket) have the ability to ‘clip’ web pages. The application makes a copy of the page you’re viewing, often with the option to clean it up significantly. Then you can print this copy instead of the original. Copy/paste is your friend. Depending on the content, sometimes the most expeditious solution is to select the content you want to print, copy it, and then paste it into a word processor where you have more control over how the results will be printed. There’s no doubt that printing is complicated. In part, this is due to the fact that printers can be so incredibly different from one another. In part, it’s due to the fact that printing is often an afterthought in many applications. Regardless of the reasons, when you encounter problems such as print that’s too small to read comfortably, it’s time to go exploring. Be sure to bring a healthy dose of patience when you do. How Do I Print Hotmail Messages Without the Ads? - The trick is to print the email itself and not the page showing in your browser. I'll show you how. « Previous post: Should I Defragment My SSD or USB Flash Drives? When it comes to copying a web page, I’m nearly a 100% copy and paste kind of guy. I click on the first word, scroll down and click on the last word I want to copy and press ctrl+c (copy command). Then I open a word processor. Wordpad is great for this if you want to strip off pictures, or a text editor, such as notepad if you want to strip of all formatting. You then can edit out anything extraneous such as picture captions or unwanted links. I’ve been using the Atlantis Word Processor (disclaimer: this is my experience and not an Ask Leo! recommendation), which I got from Giveaway of the Day, for that. It’s a pretty cool stripped down word processor which has exactly the features I need for day to day stuff. It’s best feature is that it’s lightweight and starts up in 1-2 seconds. I use a full featured word processor like Word or Libre Office if I want to get the pictures and links. Sounds like you have “Multiple Pages per Sheet” (or some equivalent setting) enabled and you’re printing 4 pages per sheet (if your document is only 1 page long you would see it at 25% size in the top-left corner). When you print from a program, it runs the default print driver software, but they often enhance the interface. You can look through the different menus and sub-menus to see if there’s a page size setting, or as James said a multiple pages per sheet setting. PDF programs are notorious for this as they want to provide you many different printing option. It’s a feature, not a bug. The program modifys the print screen function so you select specific areas of the screen shot. 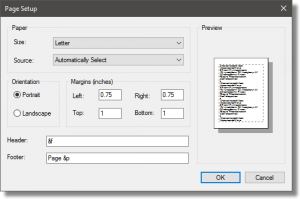 Any word processing program lets you set the font size for any selected piece of text. Perhaps the default is smaller than you want? When copying or printing an image, especially if it’s scanned from a printed paper source, if it was made with dots, you can get a scanned image that is impossible to print with any good quality. There is no printer setting that will help. I guess some images on the web could come from a source that used dots. I use my copy of Paint Shop Pro to process the image. I apply a correction under EFFECTS >ENHANCE PHOTO and then I use MOIRE PATTERN REMOVAL. What a difference. Wavy, fuzzy areas of color suddenly become smooth and filled in and they print the way you would want. It’s a useful trick for images. If you want a complete web page without most of the ads (not a screenshot) give the chrome extension cleanprint a try. It has some nice options such as text only and PDF outputs, and allows limited edits. I have a Microsoft windows 10, recently I get yahoo e-mails they are fine on screen, but when I try to print out, I get microscopic print-outs. Instructions I got from Yahoo, are to go into menu, click options, click advanced settings. and advanced settings When I click options, I do not get advanced settngs but get a page with questions about firewall, google, which I cannot answer. What to do to enlarge e-mail print-out? I can print out pictures with the right size, but not papers that is all printing.